The traditional five-form classification probably under-represents the variation within Papio. Some commentatorsargue that at least two more forms should be recognized, including the tiny Kinda baboon (P. cynocephalus kindae) from Zambia, DR Congo, and Angola, and the gray-footed baboon (P. ursinus griseipes) found in Zambia, Botswana, Zimbabwe, Mozambique, and northern South Africa. However, current knowledge of the morphological, genetic, and behavioral diversity within Papio is too poor to make any final, comprehensive judgment on this matter. All baboons have long, dog-like muzzles, heavy, powerful jaws with sharp canine teeth, close-set eyes, thick fur except on their muzzles, short tails, and rough spots on their protruding buttocks, called ischial callosities. Thesecalluses are nerveless, hairless pads of skin that provide for the sitting comfort of the baboon. Baboons are terrestrial (ground dwelling) and are found in open savannah, open woodland and hills across Africa. Their diets are omnivorous, but mostly herbivorous, yet they eat insects and occasionally prey on fish, trout and salmon if available, shellfish, hares, birds, vervet monkeys, and small antelopes. They are foragers and are active at irregular times throughout the day and night. They can raid human dwellings, and in South Africa, they have been known to prey on sheep and goats. Their principal predators are Nile crocodiles, lions, spotted and striped hyenas, leopards and cheetahs. They are considered a difficult prey for the leopard, though, which is mostly a threat to young baboons. Large males will often confront them by flashing their eyelids, showing their teeth by yawning, screeching, making gestures, and chasing after the intruder/predator. Although they are not a prey species, baboons have been killed by the black mamba. This usually occurs when a baboon accidentally rouses the snake. Most baboons live in hierarchical troops. Group sizes vary between five and 250 animals (often about 50 or so), depending on specific circumstances, especially species and time of year. The structure within the troop varies considerably between hamadryas baboons and the remaining species, sometimes collectively referred to as savanna baboons. The hamadryas baboons often appear in very large groups composed of many smaller harems (one male with four or so females), to which females from elsewhere in the troop are recruited while they are still too young to breed. Other baboon species have a more promiscuous structure with a strict dominance hierarchy based on the matriline. 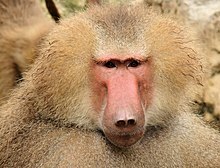 The hamadryas baboon group will typically include a younger male, but he will not attempt to mate with the females unless the older male is removed. The collective noun for baboons is commonly “troop”. In the harems of the hamadryas baboons, the males jealously guard their females, to the point of grabbing and biting the females when they wander too far away. Despite this, some males will raid harems for females. Such situations often cause aggressive fights by the males. Visual threats are usually accompanied by these aggressive fights. This would include a quick flashing of the eyelids accompanied by a yawn to show off the teeth. Some males succeed in taking a female from another’s harem, called a “takeover”. In many species, infant baboons are taken by the males as hostages during fights. Baboon mating behavior varies greatly depending on the social structure of the troop. In the mixed groups of savanna baboons, each male can mate with any female. The mating order among the males depends partially on their social ranking, and fights between males are not unusual. There are, however, more subtle possibilities; in mixed groups, males sometimes try to win the friendship of females. To garner this friendship, they may help groom the female, help care for her young, or supply her with food. The probability is high that those young are their offspring. Some females clearly prefer such friendly males as mates. However, males will also take infants during fights to protect themselves from harm. A female initiates mating by presenting her swollen rump to the male’s face. Females typically give birth after a six-month gestation, usually to a single infant. The young baboon weighs approximately 400 g and has a black epidermis when born. The females tend to be the primary caretaker of the young, although several females will share the duties for all of their offspring. After about one year, the young animals are weaned. They reach sexual maturity in five to eight years. Baboon males leave their birth group, usually before they reach sexual maturity, whereas females are philopatric and stay in the same group their whole lives. ^ Jump up to: a b Groves, C.P. (2005). “GENUS Papio“. In Wilson, D.E. ; Reeder, D.M. Mammal Species of the World: A Taxonomic and Geographic Reference (3rd ed.). Baltimore: Johns Hopkins University Press. pp. 166–167. OCLC 62265494. ISBN 0-801-88221-4. Jump up ^ Newman TK, Jolly CJ, Rogers J (2004). “Mitochondrial phylogeny and systematics of baboons (Papio)”. American Journal of Physical Anthropology. 124 (1): 17–27. doi:10.1002/ajpa.10340. PMID 15085544. Jump up ^ Frost SR, Marcus LF, Bookstein FL, Reddy DP, Delson E (2003). “Cranial allometry, phylogeography, and systematics of large-bodied papionins (Primates:Cercopithecinae) inferred from geometric morphometric analysis of landmark data”. Anatomical Record. 275 (2): 1048–1072. doi:10.1002/ar.a.10112. PMID 14613306. Jump up ^ Wildman DE, Bergman TJ, al-Aghbari A, Sterner KN, Newman TK, Phillips-Conroy JE, Jolly CJ, Disotell TR (2004). “Mitochondrial evidence for the origin of hamadryas baboons.”. Molecular Phylogenetics and Evolution. 32 (1): 287–296. doi:10.1016/j.ympev.2003.12.014. PMID 15186814. Jump up ^ Jolly, CJ (1993). “Species, subspecies, and baboon systematics”. In WH Kimbel; LB Martin. Species, Species Concepts, and Primate Evolution. New York: Plenum Press. Jump up ^ “AWF: Wildlife: Baboon”. 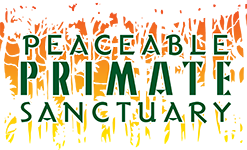 African Wildlife Foundation. Archived from the original on 17 September 2008. Retrieved 2008-08-18. Jump up ^ Jonathan Grainger; Stéphane Dufau; Marie Montant; Johannes C. Ziegler; Joël Fagot (2012). “Orthographic processing in baboons (Papio papio)”. Science. 336 (6078): 245–248. doi:10.1126/science.1218152. PMID 22499949. Jump up ^ “AWF: Wildlife: Baboon”. African Wildlife Foundation. Jump up ^ Bauchot, Roland (2006). Snakes: A Natural History. Sterling. pp. 41,76,176. ISBN 978-1-4027-3181-5. Jump up ^ Bergman TJ, Beehner JC, Cheney DL, Seyfarth RM (2003). “Hierarchical classification by rank and kinship in baboons”. Science. 302 (November 14): 1234–1236. doi:10.1126/science.1087513. PMID 14615544. Jump up ^ “OED Collective nouns”. Retrieved 2006-11-26. Jump up ^ Altmann, J.; Hausfater, G.; Altmann, S. A. (1988). “Determinants of reproductive success in savannah baboons, Papio cynocephalus“. In Clutton-Brock T. H. Reproductive success: studies of individual variation in contrasting breeding systems. Chicago (IL): University Chicago Press. pp. 403–418. Zinner, Dietmar; Groeneveld, Linn F.; Keller, Christina; Roos, Christian (2009). “Mitochondrial phylogeography of baboons (Papio spp.) – Indication for introgressive hybridization?”. BMC Evolutionary Biology. 9 (83). doi:10.1186/1471-2148-9-83.